The ink cartridge for printing is located in the franking machine and contains ink that has been tested and approved by the postal service. The ink cartridge uses ink jet technology. It requires the print head nozzles to be cleaned regularly to provide a good printing quality. The system performs cleaning automatically or on your request. You can also clean the heads manually if the automatic cleaning is not sufficient. The ink cartridge contains two print heads that have to be aligned. NOTE: The Power cord must be plugged in to move the cartridge into the ‘replacement’ position. 1. 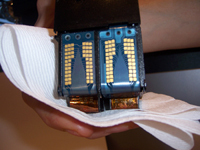 Open the cover: the ink cartridge moves to the replacement position. NOTE: Keep fingers away from the ink cartridge while it is moving to the replacement position. 2. Press down on the back of the ink cartridge to disengage it. 3. Lift out the old ink cartridge. 4. Remove the protective strips from the new ink cartridge. 5. Insert the new ink cartridge, and then push it forward until you hear the click. The alignment process of the printing heads starts automatically. 1. Remove the ink cartridge from the franking machine. 2. Give the print heads a good clean with a warm damp cloth or tissue. 3. Holding the alcohol wipe enclosed with your cartridge, or a few sheets of tissue paper against the heads, hold the cartridge so the brass print heads are pointing down and away from you and shake well. (INK MAY LEAK SO USE IN CAUTION!!!) Hold the tissue tight against the brass print heads. 5. If you see the similar to the image below, either no ink or broken ‘tram’ lines, wipe the print heads using the alcohol wipe enclosed or damp tissue and try the process again. 6. If the problem persists try cleaning the brass print heads with a cloth, some warm soapy water and repeat the process above. 2. Remove the ink cartridge from the franking machine. 3. Using a clean, dry lint-free cloth or the alcohol wipe supplied or a rubber clean, rub the cartridge contacts from the top to the bottom. The contact area of the cartridge should be rubbed briskly to clean the gold contacts. Ensure that you wipe your finger over the corresponding gold pins inside the franking machine to ensure no ink is on them. 4. Re-insert the cartridges and close the franking machines top cover. 5. Print a test page. If the problem persists, please contact Mailcoms via the details below. If the print on envelopes or labels looks unclear or dirty in some way, clean the headset to restore the print quality. If the headset has to be cleaned too often, change the automatic cleaning interval as indicated. 2. Select “Ink Cartridge” and press OK.
3. Select “Cleaning Process” and press OK.
1. Press the Menu buttonthe Menu button. 1. Open the base cover. 3. Clean the heads with a soft damp cloth. 1. Select the Menu button. 3. Select “Ink Cartridge Information” and press OK.
2. Select “Maintenance” and press OK.
3. Select “Ink Cartridge” and press OK.
4. Select “Ink Cartridge Information” and press OK.
4. Select “Headset Alignment” and press OK.
5. Press “OK” and put a piece of paper in the mail transport. The system will print a test pattern. The Set headset alignment screen is displayed. 6. Check the printed pattern and use the UP/DOWN keys to select the letter that corresponds to the straightest and complete vertical line (e.g. E). 7. Press “OK” to validate. 8. Repeat the previous step until lines F are aligned. 9. Press the back button to go back to the ink cartridge menu after alignment is completed.